between one faith and another and made love of all human beings as base of their religion. Ibn Arabi went to the extent of saying hubbi deeni wa shari’ati i.e. love is my religion and my shari’ah. It is very meaningful statement for those who believe in entire humanity and want to build human civilization on love, not on hatred. Love not only leads to tolerance but also demolishes all movements based on extremism and exclusive truth. One who loves entire humanity always adopts inclusive approach and feels truth cannot be monopoly of some exclusive group. Sufis, in that sense are far more democratic with their pluralist approach. They feel Allah has created diversity (5:28) and we must respect diversity as Allah’s creation. One who has doctrinaire approach believes in exclusivity and disparages diversity as for them diversity negates the concept of exclusive monopoly of truth by one group. And if truth is not exclusive monopoly of truth no one community can be privileged as possessor of truth. 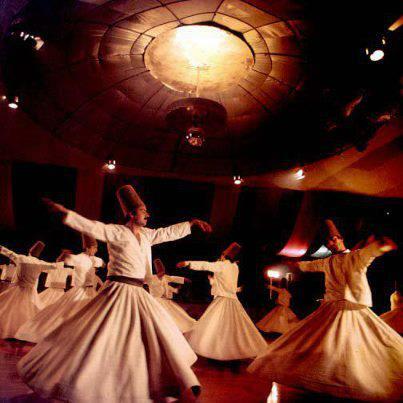 Moreover Sufism is based on deep spiritual approach and on looking into ones inner self. Spiritualism is like an ocean and narrow identities are like small rivers bounded by banks and its course predetermined. Thus spiritualism is far more inclusive, in fact inclusive, of several rivers into which all specificities merge into oblivion. And only ocean remains. Maulana Rum, when asked what is his identity replied ‘love’ as love is inclusive of all identities. Now the question arises what is love? Often we are mistaken and we think we possess one whom we love. In fact such sense of possession is very negation of love. One whom we love we must respect dignity and integrity of that person and that is possible only when we concede full freedom to that person. Where there is sense of possession we deny freedom to that person. Thus when a man thinks he loves a woman his love cannot be genuine unless he allows her full freedom and respects her dignity and integrity. Thus for Sufis too, love of humanity is based on these principles and they respect dignity and integrity of all faiths which are sincerely held by any human being or a community of human beings provided these faiths are sincerely held. Also, love cannot be genuine unless it is pure and purged of all traces of selfishness and personal desires. 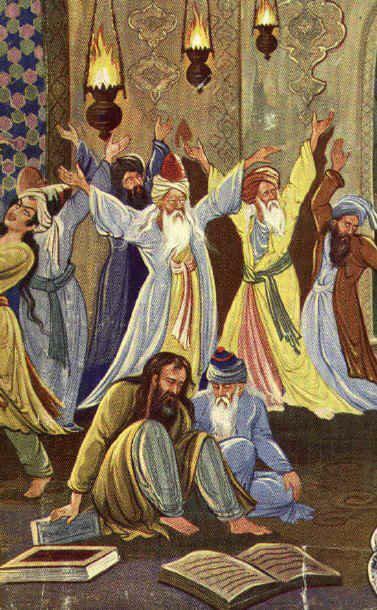 All selfish desire has to be renounced to make love genuine and hence Sufis talk of tark (renunciation) and the highest degree of this renunciation is described as tark-e-tark i.e. renunciation of renunciation i.e. one should not even fee that one is renouncing for the sake of one’s loved one. It should be absolutely painless renunciation. Thus a Sufi renounces his material comforts and selfish desires for the sake of Allah whom he/she loves intensely. Sarmad Shahid whom Aurangzeb beheaded as he would not recite the Islamic kalmia la ilaha illallah (there is no god but God) but only la ilaha (there is no god) when asked when sword was raised to behead him why don’t you recite illallah (except one God) he replied how can I say illallah when so many gods of desire are still in my heart. Thus Sarmad maintained that when so many idols of desires are still in my heart how can my love of Allah (one God) be sincere and genuine. Thus a true believer or lover of one God has to purge all idols of desire installed in ones heart. Thus the lowest degree of love is one which is polluted by selfish desires and highest degree of love is one which is purged of all desires. 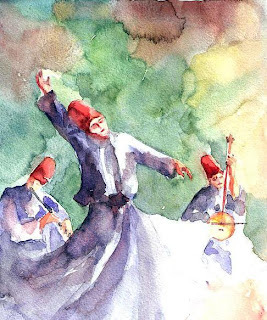 Thus great Sufi saints who renounce all desires (though living in this world and involved in all the ties) manage to achieve the purest form of love. 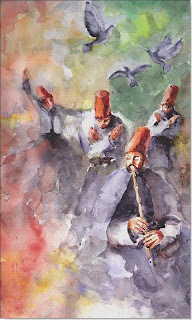 Some people reject Sufi Islam saying they believe invoking these Sufi saints for achieving some personal desire and overcoming troubles but I am not concerned with this invocation or intercession. I accept Sufi Islam for its adherence to love in its truest form and selfless love of entire humanity in all its diverse cultural manifestations. 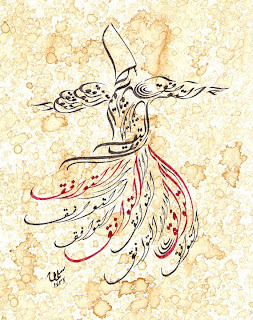 Invocation of Sufi saints or seeking his intercession is, in fact, part of human weaknesses. In Fact Sufi saints believe that total submission to Allah, the beloved, is part of their love of Allah and hence accept it as part of their love of Allah. They also call it tawakkul i.e. total trust in Allah as he does whatever He does, for the good of His servant. A lover has to accept the will of his/her beloved having full faith in the beloved. One may say there is contradiction here. Well human behavior has to bring about reconciliation in what appears to be a contradiction. Submission here does not mean submission without efforts. ‘Amal (action, effort) is vital part of human existence and one has to make constant efforts to overcome contradictions and conform to fundamental values of one’s faith. One has to make constant efforts to uphold values and curb desire, anger and greed. It is absolute requirement of love and to relate to beloved. Please tell me who made that amazing calligraphic figure.